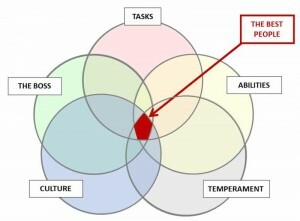 Home > Organizational Development > Talent Management – Is Your Recruiting Process Effective? When recruiting, your analysis of the right candidate for your company’s organization needs to be comprehensive and specific. TASKS: Let’s say you need a PHP developer, but you need someone who has worked on websites like yours because yours presents certain specific and unusual problems and you need someone to solve those problems. And let’s say that you don’t specify the exact experience that you need as a check-off requirement. You just say, “Needs X years of website experience.” The chances are good that you will hire someone who has good experience, but cannot solve your problems. You need to specify the tasks, abilities or experience precisely. ABILITIES: Let’s say you do specify that experience and you find someone who worked on a website that presents the same problems, but you fail to ask the candidate if s/he is a very detailed person. And s/he is not and makes mistakes because of it…and so is not very productive. That’s what you will hire. You need to specify the underlying skills that suggest that the person CAN do the job. TEMPERAMENT: Let’s say you do everything else right, but you don’t specify that the person still has a passion for software development, and you hire someone who doesn’t. They will be gone as soon as they realize that they don’t love what they are doing. You have to specify that the candidate wants to do the job. CULTURE: Let’s say you specify everything about the person and the job, but the person does not fit your company’s culture. That won’t work in the long term. BOSS: And, lastly, let’s say that everything else is there, but the boss just will not like the new employee’s work ethic. There is no values alignment about effort. That won’t work in the long term, either. In summary it is very important to be very specific and detailed in the assessment of potential candidates to ensure you find an individual who will meet all of your needs and have a great career with your company. Recruiting is the first step in an effective Talent Management Process. This blog was written by my colleague and friend John Wentworth of Wentworth Recruiting located in San Pedro, CA. The Wentworth methodology researches as many as 50 pieces of information (job related, organizational/cultural fit related, and workplace fit related) about each candidate and thus measures the whole person against both the job and work environment. You can find out more about the Wentworth Process by calling John at (310) 732-2301 or dropping him a line at johnwentworth@wentco.com. About the author: Bruce Dougan is the head of Group50’s Organization Design and Development Practice which provides Talent Management assessments and workshops. Bruce and the Group50 team are all former executives with well-known manufacturing and distribution companies who understand what it takes to design, train, develop and motivate organizations to successfully implement a company’s strategic plan. You can reach us at (909) 949-9083 or send a note to info@group50.com.